The farm where I live, has been in my family since the 1860's. 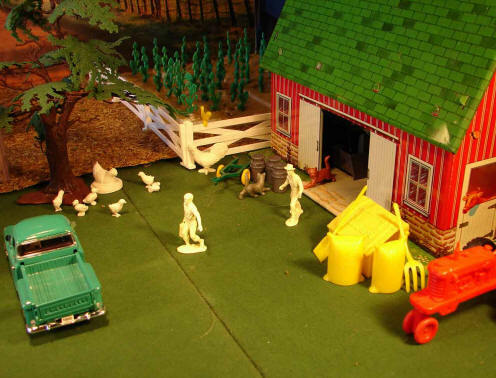 It was my great-grandfather's farm. I'll tell you more about him in next issue's Civil War article. My grandfather inherited this 121 acre piece of land from his dad. 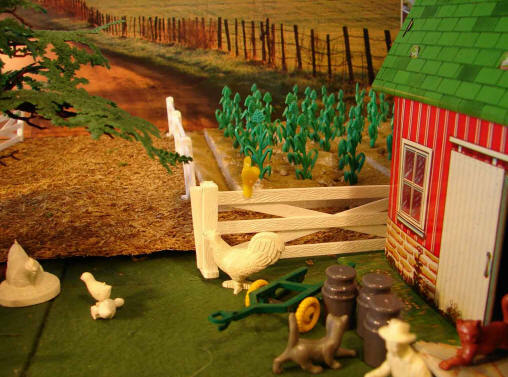 In the mid-1960's it was designated an Illinois Centennial farm. My grandfather originally left Illinois after he was married and moved to Detroit to work in the car plants. When the depression hit, a lot of people were out of work, and it was hard times trying to keep steady work on the car assembly lines. My grandpa gave all his money to a friend in order to prevent the bank from taking this friend's house. Being broke, and with irregular work, my grandpa and grandma moved back to southern Illinois and took over the old farm. In those days, rural Illinois had no electricity. At night, the house was lit with large oil lamps. My grandpa used horse drawn implements to work the land. He raised corn. They had no indoor plumbing. 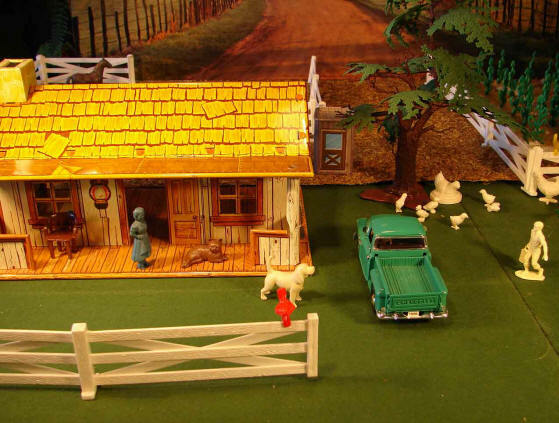 For heat, they used a wood burning pot bellied stove just like the Marx Western Ranch playset stove! 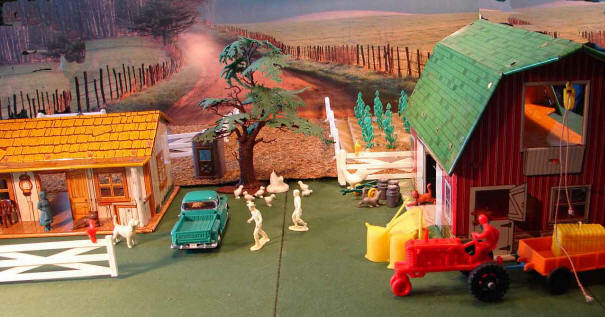 As a kid, I loved to visit the farm. I got to climb around in the barn loft, collect eggs, work in the garden, milk the cow, and help with the horses. The livestock on the farm included pigs, chickens, American Guernsey cows for milking, and polled Herefords for meat and selling. My grandma was German, so the pigs were always being turned into sausage and other tasty pork products!! My grandma's garden had tomatos, pole beans, cabbage (for homemade kraut! ), potatoes, cucumbers (for dill pickles and white sweet corn! As a break from work, my g'pa would like to go to the garden and get some potatoes. He would peel me one, and we would sit on the front step and eat them raw with a little salt from his big metal salt shaker. To this day, I still prefer a cool, crunchy raw potato to a cooked one! Water came from a cistern and was drawn with a hand pump (yes, just like the Marx Western Ranch accessory!) During the hot summer days, this water was so cool even without refrigeration. My grandma could make the best lemonade! There were several large ponds on the farm that the livestock used for water. My grandpa stocked these ponds with bass and bluegill and loved to take me fishing. After the day's work was done, I would sit in the swing on the front porch and listen to the stories my g'pa would tell about working on the early car lines in Detroit, family history, and the Civil War stories he knew about his dad. 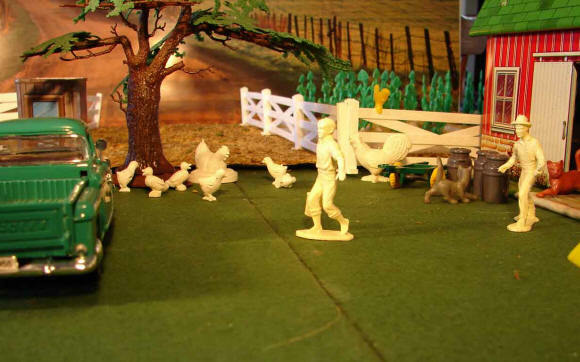 The fence that surround our farm wasn't like the neat white board fence in the Marx farm sets. My grandpa cut rough post and put them in the ground by hand, then strung barbed wire on them. They didn't look like much, but most of the fence that my grandpa put up in the 1930's is still standing! When I graduated from dental school, I moved back to southern Illinois. Having no money, my wife and I moved into my grandparents old farm house. We redid the interior, put new siding on, and reshingled the roof. It was cozy and nice until we had three kids! After we built our new house, the old farm house seemed to just fall apart. Some of the ceilings fell in, and there were water leaks in the walls! During our famous tornado, a tree fell across the back of it further causing ceiling collapse. Just recently, lightning hit the old barn and burned it to the ground. With no one to care for it, the old farm is slowly being reclaimed by nature. I can walk over the grounds and still find ancient horse drawn plows or rakes rusted and covered by undergrowth. Some of the outbuildings still stand, and old saddles and tack still hang on the walls. Willows have grown around the once neatly mowed ponds. However, during the late spring and early summer, on cool evenings, the meadows still come alive with thousands of fireflies. The bullfrogs in the ponds still sound like the ones did when I was a kid. The Roy Roger Rodeo Ranch house looks just like the old farm house. 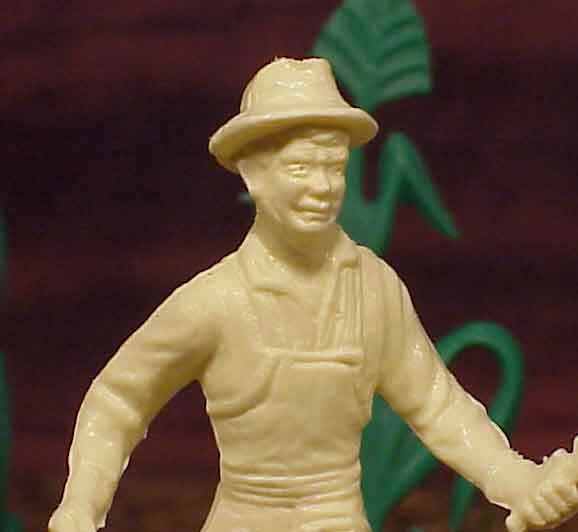 Upon closer inspection, the Marx 54mm farmer with the wrench looks just like my grandpa! The boy carrying the milk up to the house in a bucket is me.